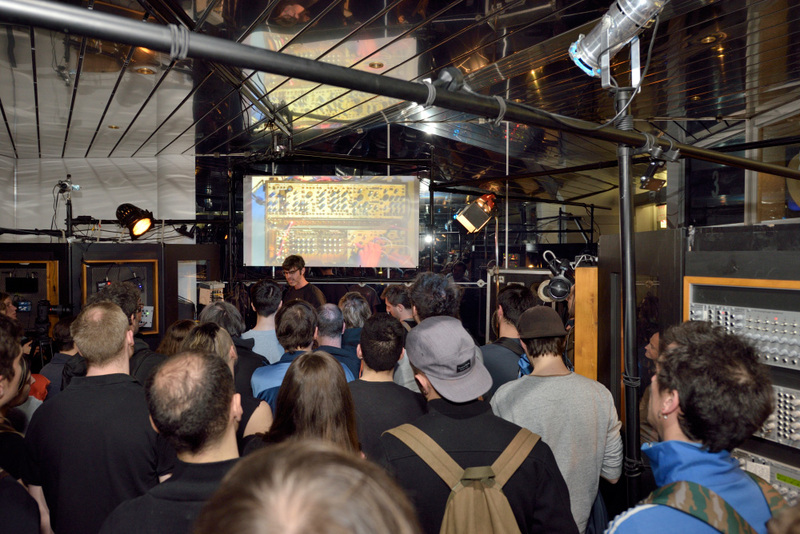 In November 2015 the so called Spiegelsalon was lended out to SchneidersLaden for a temporary showroom while they had to re-organize the shop at the Kottbusser Tor. So for a month every afternoon (except Wednesdays) there was playtime for everybody with the help of the product experts Thomas K. and Camilo Ocampo, it looked like this .. Since Jan 2016 this room was my (HerrSchneider’s) personal office again. Sometimes we used it as our meeting room to chat about what we are doing. I was sitting here to work once I did not have other dates to either plan the SUPERBOOTH or to meet up with people inside SchneidersLaden or at the ALEX4 Distribution company. The Spiegelsalon in Berlin Kreuzberg (Ritterstrasse) was an attractive shop with many mirrors (Spiegel), where I could realize my ideas of a good place to learn, making music, having some fun and a good time for all participators (the “salon”) in the beginning. After having tried to install such in the retail business at Berlins “Zentralmusik”, I had to find out that I need a silent relaxed place apart from the sales where I can do it my way. I did. We had some wonderful workshops and a good time but in 2018 I decided to give it up towards the constantly raising costs for the rent. My personal office moved back the Kottbusser to by then. The very first workshop in the Spiegelsalon was held by Ken Macbeth introducing the very first serial model of his famous and rare Elements for press partners and then for public audience and friends. Another very outstanding event was a workshop night directly after Musikmesse 2015, where we had the last very big stand organized for many participating friends of SchneidersLaden and ALEX4 from all over the world. Make Noise, 4MS and Mark Verbos each made a great 20 minutes workshop before i played a little life session together with Peter Kirn on just an XBase and a Meeblip Synthesizer.. Most of the time the Karussell was based in the window, ready to warm up ourselves, our friends and audience for the events and workshops, the little stage behind it was camera controlled, I hope we will get it go again .. one day. See this movie showing the Karussell on Tour in Vienna 2013, it has seen some more cities of europe in between (! ).